As I’ve mentioned before, I like to garden, and not just for show. Growing my own vegetables provides food that I know is fresh and offers the prospect of saving money. And this year, those efforts took off in a major way, thanks to the effort I sank into building two large raised beds during last summer’s paternity leave. My growing season isn’t quite over–I picked some arugula earlier today–but it’s time to assess how things went. Meet my new favorite crop. I didn’t have to buy lettuce for two months straight in the spring–and I had enough left over to be throwing arugula into risotto and tomato-sauce recipes. I was a little slow to seed a second crop, but as I just wrote, it’s apparently outlasted the first frost here. I’m hoping this reseeded itself, but even if that doesn’t happen I can’t think of a more profitable expenditure of $2 and change on a packet of seeds. A new crop for me, these were almost as prolific as arugula. The only reason I didn’t wind up pickling a bunch was because I have three or four different cucumber-salad recipes and at least two for cucumber soup. And as I learned from the cuisine at a rest stop on a bike tour, you can make a tremendous sandwich out of cucumbers and tomatoes. Another first-time crop, these had a slow start but took off in August and September. Unfortunately, I didn’t realize how many of my pepper plants were of the “OMG hot!” variety; there’s only so much you can do with them. This is a collective grade, covering basil, parsley, mint, oregano, sage, thyme, rosemary and cilantro. Mint and parsley were the most consistent; although I had to reseed the latter halfway through the summer, those plants still look great. Basil got going slower than in prior years, delaying pesto-sauce season until late August. The sage did a little better than I’m used to; oregano and thyme, a lot better. Part of the rosemary plant died off, but the rest did fine. And for once, I got cilantro to grow in both the spring and fall. This was good in the spring–especially compared to prior years, which speaks to the benefits of amending dirt with peat moss and compost–but the fall crop has barely yielded enough for two sandwiches. For the amount I planted, you’d think I would have been able to collect more than a single handful of beans each time. But they did taste good, and I know I neglected to pick some once the tomato, pepper and cucumber plants got in the way. In the bargain, my lame legumes fixed nitrogen in the soil for next year’s vegetables… or so I hope. The plants I stuck in a large clay pot (and shielded with plastic netting to avoid providing a banquet for the squirrels) would have done better had I watered them more consistently and checked for new fruit more often. Too bad, since strawberries can be bland at the supermarket and rarely last long from the farmer’s market. This pains me: I’m from New Jersey, where we named a whole family of tomatoes after the state, and as an American of Italian ancestry I take great pride in my ability to cook tomato sauce from scratch (not to mention gazpacho). But this is the fourth year in a row of woeful results. Once again, I had far more foliage than fruit. And although I planned to prevent the local squirrels from snacking on half-green tomatoes (they always seem to do this the day before I plan on picking them) by draping plastic netting over the entire bed and anchoring it to its walls, I left enough of a gap for one or two of these varmints to eat half of the single most promising tomato. A dry May and June, followed by a thoroughly soaked August, don’t seem to have helped matters. And by the time these plants mounted a comeback in the fall, they weren’t getting enough sunlight to yield anything bigger than the sad specimen you see at right. Can somebody please tell me what I’m doing wrong here? 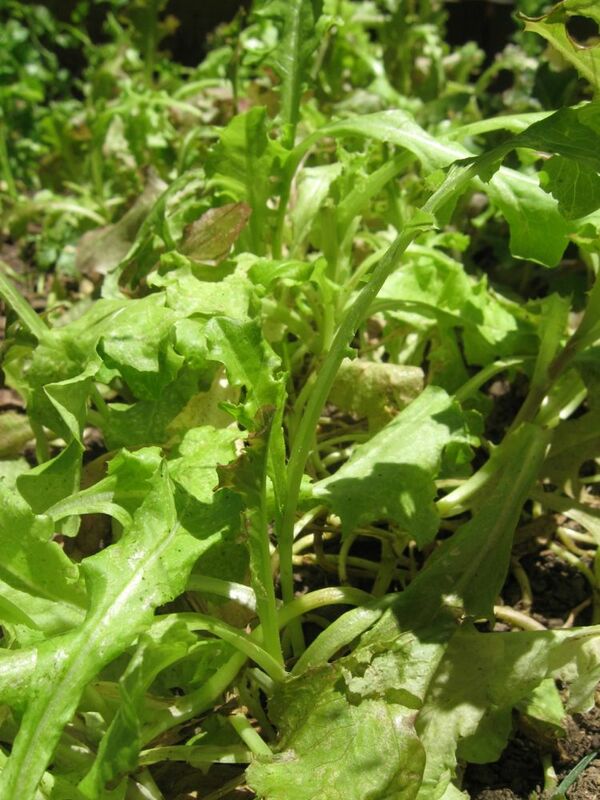 This entry was posted in Cooking, Gardening, Outside interests and tagged arugula, cucumbers, garden herbs, green beans, kitchen garden, lettuce, peppers, raised beds, strawberries, tomatoes, vegetables by robpegoraro. Bookmark the permalink. You may be giving your tomatoes too much nitrogen. Oddly, very few references discuss squirrels as garden pests, but I’ve had lots of problems with them and tomatoes. I have my gardens fenced to keep deer and rabbits out, but for squirrels you have to watch out for overhanging branches too. I lost a big oak tree in a storm a couple of years ago and that reduced my local squirrel population. Also, last winter a fox took up residence under my garden shed and either scared the squirrels away or fed them to her kits. 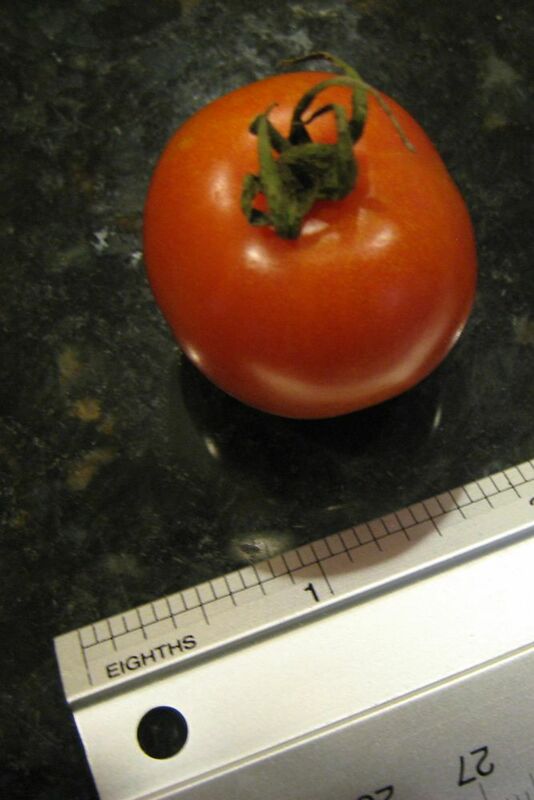 I had a great early crop of tomatoes, but the late summer rains were disastrous. Inspiring to hear that you are a man of the earth. And that you have a child to whom you can pass this knowledge. Keep trying new things every year, take heart in your successes and learn from every aspect of it! A dog or cat will do wonders for the squirrel problem… The “OMG hot!” was probably enhanced by the dry start to the summer. The hotter and dryer the summer is, the hotter the peppers are. If you have too many drop them in a jar of vinegar and use the hot vinegar in salad dressings and such. Also, learn thai cookery. Rob, we’re with you all the way with the tomatoes. Grew plants in eastern panhandle of WV and on Chincoteague Island VA and the issues were about the same as yours minus the squirrels in Va. We made lemonade from lemons by picking all those green tomatoes before frost and using a cucumber pickling mix from the local farm market to make polish pickled tomatoes. Tastes better than the ones our Polish friend imports from his sources in Baltimore according to him!! I battled the squirrels for years. They would pluck an almost ripe one, drag it to my dining room window, wait until I was there, take a bite and….discard it. I know they have brains the size of peas but it was all about raiding my tomato “crop”. I surrendered after trying nets, moth balls, stinkers…wishing you luck.